It’s the last week of classes at Keene State, so today I handed back a fat stack of research drafts: the last I’ll see of them until next week’s deluge of final portfolios. It’s been an exhausting week, with that fat stack of drafts arriving right as one online term ended and another began: three fresh online classes that had the audacity to begin right when I’ve been busy with endings. After nearly a week of almost-all-nighters, I feel wrung-out, looking ahead to the weekend and a chance to soak up sleep like a sponge. The end of the semester can’t come soon enough. Every spring, you’d think I’d never seen baby beech leaves before. 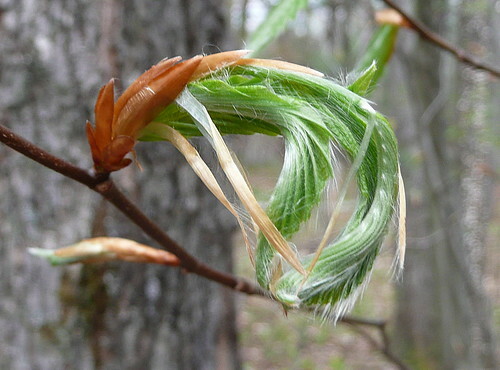 Months of bare-branched winter will do that to you, so that in spring the merest glimpse of green drives you to ecstasy. There’s something simply magical about the fresh, furrowed, and furry leaves of spring as they unwind from their leaf scales: a summer of promise stretching toward its first light. Yesterday afternoon, after springing from the containment of the classroom, I took Reggie walking along the Ashuelot River, where we both went wading. The first doggy dip of the season is always a milestone, and I had new sandals to baptize, wading up to my ankles as I tempted Reggie to muddy his toes. 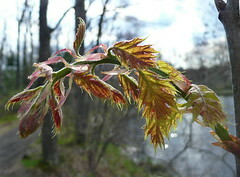 Reggie always seems timid the first time he goes wading in the spring, and I always forget how alien newly unfurled leaves look. 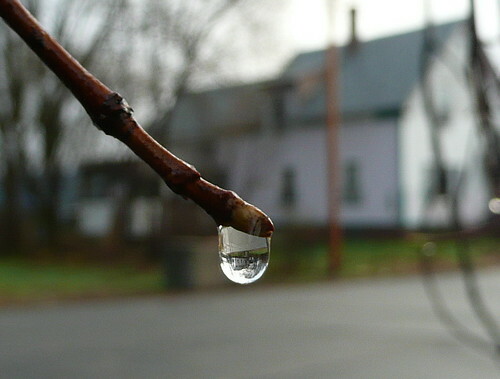 We might credit both to “winter amnesia,” a seasonal disorder whereby those of us in colder climes forget almost entirely the pleasures of summers past. But only almost. Once Reggie remembers that river-water is cool and refreshing, he doesn’t need additional urging, sniffing out the tried, familiar spots where the river bank slopes gently to sun-warmed shallows. In all the years we’ve gone wading together, I’ve never seen Reggie swim; instead, he’s content to wade to his belly, sniffing and lapping water as he walks, before clambering onto shore again, his underparts drenched and spectacularly bedraggled. Why do you need to swim, Reggie seems to say, when it feels so good just to wade? Yesterday’s walk and wade along the Ashuelot was short: I had (and have) a river-long to-do list, and the afternoon light was already slanting toward sunset. 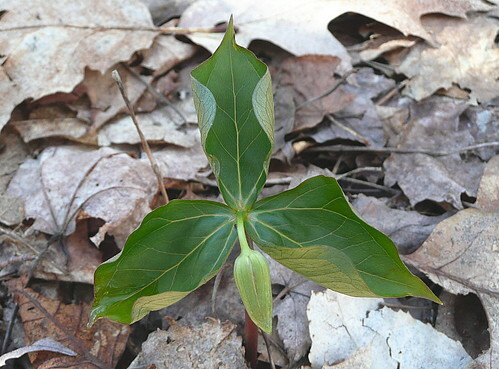 But the lesson of baby beech leaves is that even a small spot can provide ample room to unwind, the small space of a single leaf seeming expansive after the crowded clench of winter buds. 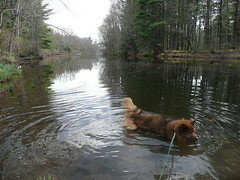 This won’t be the last time Reggie and I will wade in the Ashuelot; you can, it seems, step into a similar river twice. We’ll be back, after and even while I ride the white-water of my river-long to-do list, an afternoon walk and wade offering a cool, refreshing respite for dog and dog-walker alike. 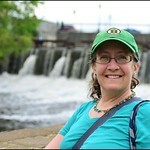 Click here for a photo-set of images from yesterday’s afternoon along the Ashuelot. 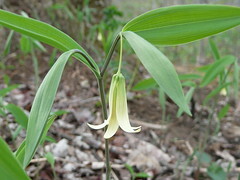 The close-up shot of sessile bellwort shows the blooming “after” version of last week’s budding “before.” Enjoy! Suburban Newton is the last place I’d expect to see bloodroot blooming, but here it is, sprouting from the crevice between a residential stone wall and the city sidewalk. 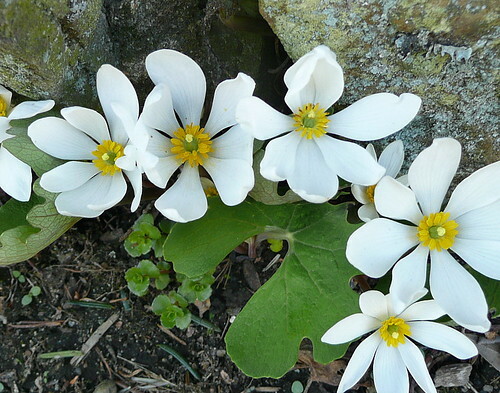 Has bloodroot bloomed perennially from any available nook since this too was forest? If so, its blood-red sap pulses more powerfully–and with greater persistence–than I’d ever imagined. “What’s a flower like you doing in a place like this,” I’ve wondered these past few days on my morning dog-walks. 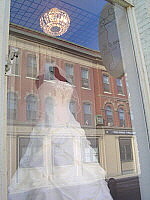 And yet, suburbia turns out to be wilder than I’d thought, a world of surprise fringing every inch of sidewalk. 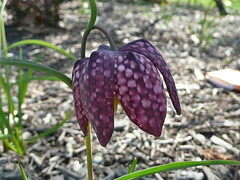 What is this never-before-seen flower sprouting from a garden I pass every weekend? What crazed creator dreams up flowers that look like lampshades, their innermost parts visible only if you put your camera on the ground and shoot upwards, blindly. 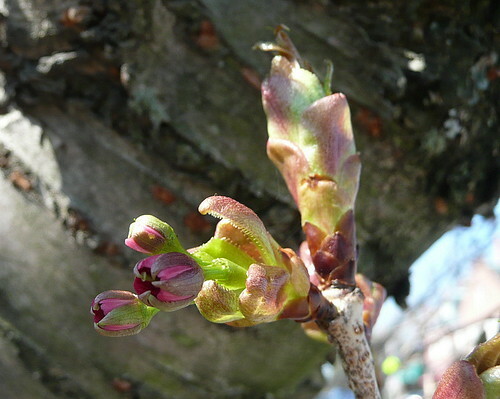 Even something as tame as a domesticated crabapple is wilder than I thought, sprouting buds that look more like voracious aliens than anything I’d gladly stick my nose into. It’s a jungle out there, and in spring you never know what sorts of oddities will show up in place like this. 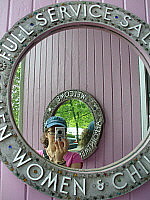 Click here for a photo-set of images from yesterday’s dog-walk. Enjoy…and if anyone knows what the lampshade-like flower is, please enlighten me. 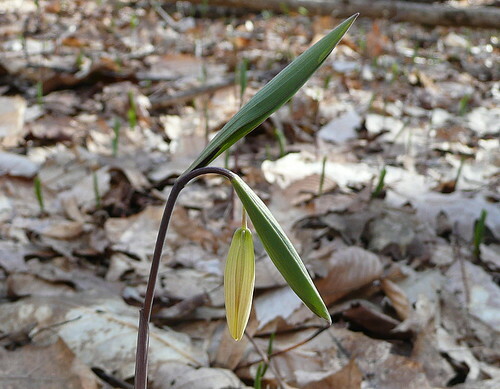 Although most of the ground atop Beech Hill is still brown with last year’s leaves, the buds of both wake-robin (Trillium erectum, also known as purple or red trillium) and sessile-leaved bellwort (Uvularia sessilifolia, also called wild oats) are thinking ahead. I know from past years that the wildflowers atop Beech Hill will be blooming by May Day, so yesterday I took a quick dog-walk up the hill and back to catch a sneak peek at spring in the making. 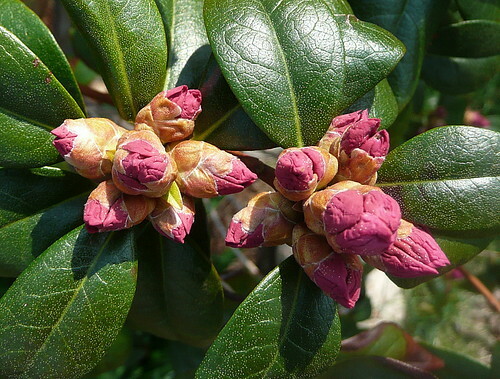 Sure enough, I found buds amongst the brown: a foretaste of next week’s flowers. This is my quick and dirty contribution to this week’s Photo Friday theme, Brown. Given that I wanted to blog these pictures anyway, I figured the fact that their background is brown qualified as ample excuse. I walked Reggie early this morning, in the respite between yesterday’s and this afternoon’s rain. 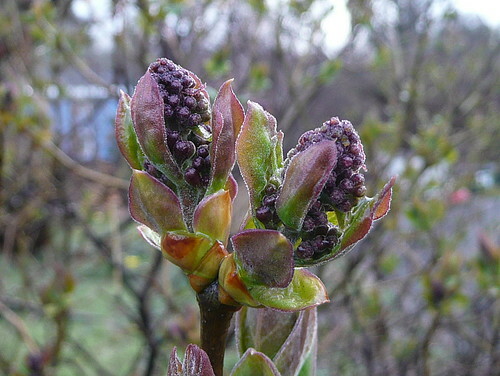 The local lilacs are only thinking about blooming, their buds tightly closed against chilly mornings and soggy afternoons. 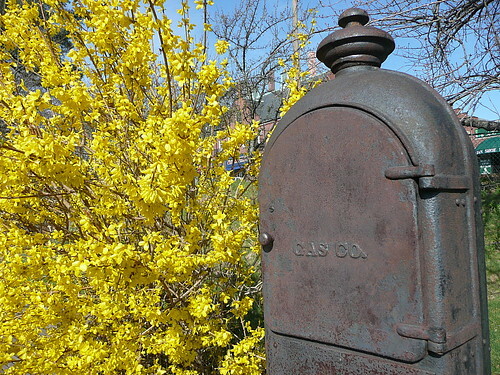 Unlike the golden trove I enjoyed this past weekend in Newton, my neighbor’s sprawling forsythia hedge in Keene hasn’t bloomed yet, although its buds are steadily yellowing like a smoldering fire. Isn’t it funny that such a fiery flower will erupt from a world so wet? 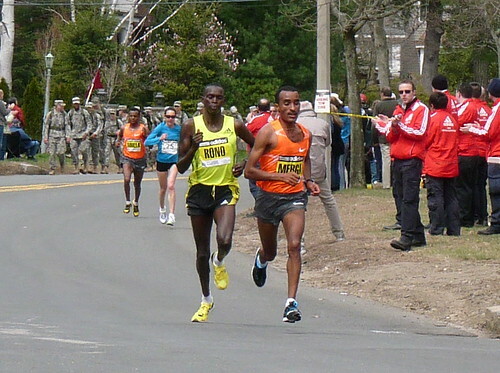 If you’ve read the news, you know that Ethiopia’s Deriba Merga beat Kenya’s Daniel Rono to win the 2009 Boston Marathon earlier today. 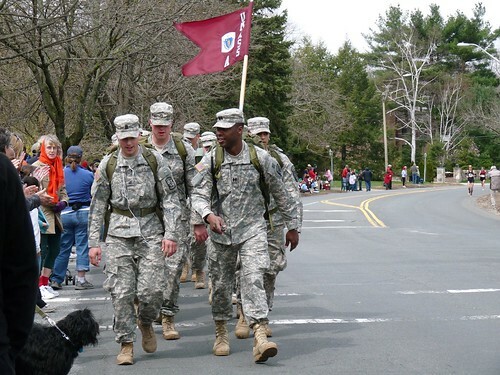 From where we sat, cheering, near the corner of Chestnut Street and Commonwealth Avenue in Newton, Merga was just starting to pull ahead of the competition. 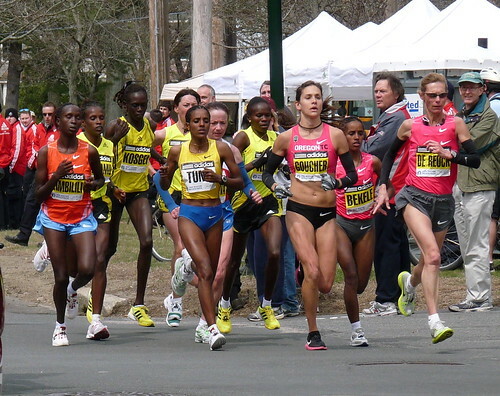 Having started before the men, the women front-runners passed our vantage place first, with first-place winner Salina Kosgei of Kenya preserving her strength near the rear of the pack while defending women’s champion and eventual second-place winner Dire Tune and third-place winner Kara Goucher of America enjoyed an early lead. 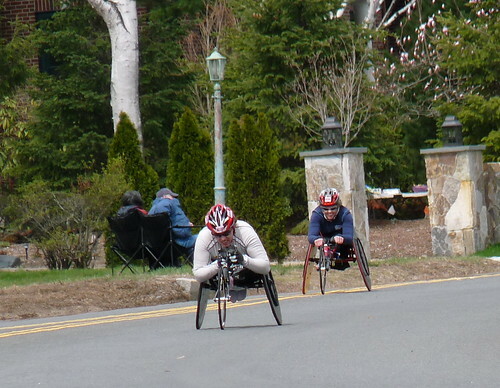 Our vantage spot was about 18 miles into the 26-mile race, and before greeting the men and women runners, we’d already cheered a pack of wheelchair-competitors racing their way toward the uphill challenge that give Chestnut Hills its name. 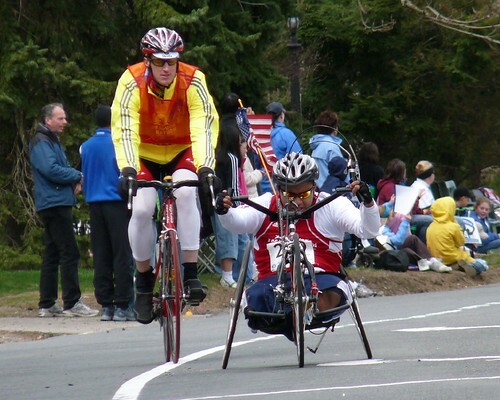 South African Ernst Van Dyk won the men’s wheelchair competition, and Japan’s Wakako Tsuchida won her third straight women’s wheelchair medal. 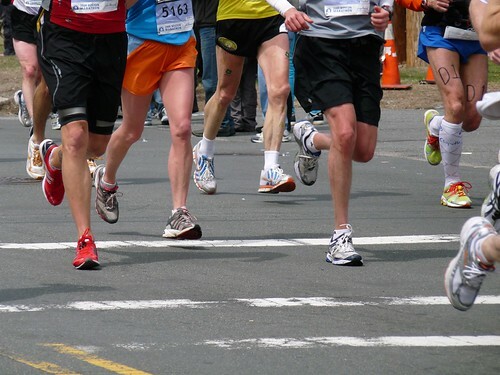 These are the names you’ll hear in news reports as having “won” the marathon, and they certainly deserve the awe and admiration of spectating fans. 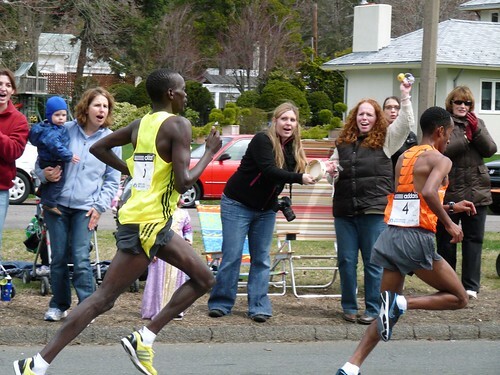 From where we sat near the corner of Chestnut Street and Commonwealth Avenue in Newton, however, there were just as many cheers for the anonymous competitors far behind media-darlings who led the pack. 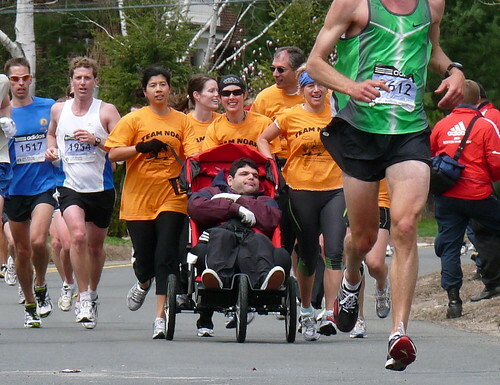 Who, for example, could fail to cheer for the smiling faces on Team Noah, who pushed 30-year-old Noah Zack the entire marathon in order to raise money for special needs residential programs? 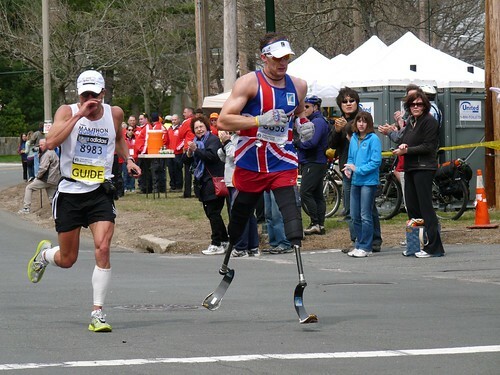 Or how about Richard Whitehead, who proved once more why he is the Marathon Champ by running 26 miles on not one but two prosthetic legs. 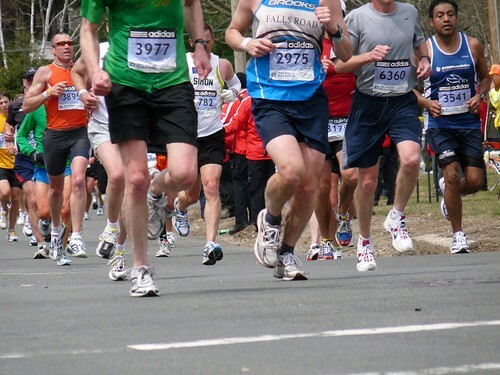 From where I sat near the corner of Chestnut Street and Commonwealth Avenue in Newton today, everyone who ran in today’s marathon is a winner, regardless of where they finished in the race. 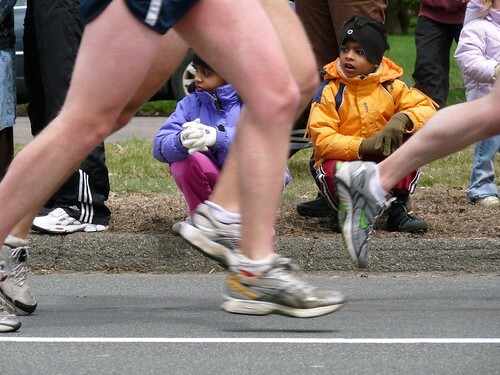 Click here for a photo-set of images from today’s Boston Marathon. Enjoy! It’s a color we haven’t seen in New England since autumn, when half of the maples turned gold and the other half turned red: a clash of primary colors. In the meantime, winter was a time of gray and white, starkly monochromatic and more trying, I think, for its lack of color than for its intensity of cold. 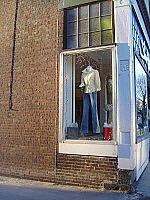 In winter, we saw occasional splashes of color: a dash of red on a passerby’s hat, or a welcome shot of green on a knitted scarf. And year-round, there is in Boston at least the briskly bright yellow of taxicabs, and the similar shade of reflective vests worn by cyclists and joggers to avoid getting hit by those same taxis. 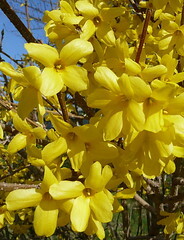 But the gold of the season’s first forsythia is different: living and thus far more precious. Even the most brilliant neon doesn’t glow with the ardor of a forsythia in full flower, for these cells are alive and burning, not so much carrying color as singing it. 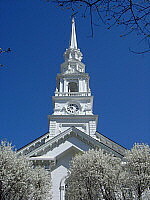 We haven’t seen this color naturally occurring in New England since autumn, for in winter not even the sun burns yellow, its winter glare being harsh and white, the color of ice. Only after the trees leaf and the sun’s rays are tempered by green will they turn yellow like a child’s crayon. In the meantime, our most trusted trove of gold grows on trees. I am, apparently, so smitten with this particular forsythia in Newton’s Waban Square, I blogged a nearly identical picture this time last year (click here, then scroll to the second photo).